Świętokrzyskie region is situated in the central southern part of Poland. It borders the Masovian, Lublin, Subcarpathian, Lesser Poland, Silesian, and Łódź Voivodeships. The capital city Kielce is from 120 to 180 km away from other Polish conurbations such as Warsaw, Krakow, Katowice and Łódź. Świętokrzyskie covers an area of 11,708 sq. km, which is 3.7% of the area of Poland, making it 15th (next to the last) in the country. The region has 1,268,2 inhabitants ( 31.12.2013), which is 3.3% of the Polish population, taking the 13th place. The density of 108 people per sq. km is lower than the average density in Poland (122 people per sq. km); and 45.2% of the population live in towns and cities. Kielce plays the role of the administrative, cultural and economic centre of the region. Świętokrzyskie Region has a special place on the geographic, historical and economic map of Poland. It is situated on the cross-road of major national transport routes in a close vicinity to the largest Polish agglomerations and the borders with Slovakia and Ukraine, which makes it very attractive to investors. Kielce industrial facilities manufacture world standard products, which is confirmed by numerous quality certificates, lists of the key world purchasers, and prizes awarded at international exhibitions and fairs. The Świętokrzyskie Voivodeship is an industrial and agricultural area; however, there is a clear division into industrial North and agricultural South. The region is dominated by traditional industry sectors related to the manufacture and working of metals, and extraction and processing of rocks and minerals (gypsum, limestone, and iron, copper and lead ores) concentrating in the area of what used to be the Old-Polish Industrial Region. Building material industry, which uses local resources, is a strength of the regional economy. Regional construction companies are among the largest and most dynamically developing businesses in the country. Other major sectors of economy include metallurgical, engineering, precise, food and textile industries. High quality of goods and services makes the offer of regional companies attractive to purchasers from many countries. The main trading partners include Germany, the United Kingdom, Ukraine, Italy and France. Significant attractiveness of regional economy and favourable climate created by the local authorities is reflected by a continuous increase in the number of companies with foreign capital established in Świętokrzyskie. 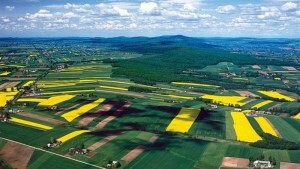 The Świętokrzyskie region is has one of the cleanest natural areas in Poland. It has a plethora of diversified, and frequently unique, species of animals and plants. Therefore, the substantial portion of the voivodeship (66% of its area) is covered by various forms of natural protection. Undoubtedly, this is one of the reasons to be proud of, but it tends to be an obstacle in pursuing investment plans. Abundant and unique forms of the natural landscape, an ideal condition of the environment, historical qualities and monuments as well as rural areas with preserved harmonious cultural landscape create the conditions for the development of tourism. Therefore, the Świętokrzyskie Voivodeship is a region of outstanding historical and natural qualities as well as a perfect geographic location. It is marked by lushness and diversity of minerals and its long industrial tradition. All of these advantages build its exceptional social and economic potential. In the Świętokrzyskie Voivodeship, on average the foreign capital is engaged in around 600 commercial companies, out of which only 16 are partnerships, and all of the others are capital companies. Economic showcase of the Region Kielce Trade Fairs, the second largest fair center in Poland, and one of the largest exhibition centers in Central and Eastern Europe, located at the crossroad of the largest domestic and international roads. In the last year, it was visited by 6,000 companies and 217,000 visitors. The Centre for business meetings, the place visited by celebrities from Poland and abroad. For over 17 years has been working on the Polish exhibition market guaranteeing visitors comfortable and memorable conditions. There is the only one demonstration area in the country, enabling dynamic presentation of heavy construction, transportation and military equipment. The Kielce Trade Fairs are famous for their International Defence Industry Exhibition organized each year, the third largest military trade shows in Europe, after London and Paris.